Academie gut strings are used by professional and serious amature musicians around the world. This is a double length, 48", medium gauge .56mm treble gut string made with beef serosa, with a natural finish. The string can be cut to fit instrument and the ends of the string are plain and can be knotted as necessary. Instructions on how to tie a string knot are on the back of each package. These strings are usually used on Baroque instruments by those musicians playing historical performance practice. Consequently, the gauges are set to the pitch of a-415. The tone is full and warm with a powerful fundamental and complex, pleasing upper partials. 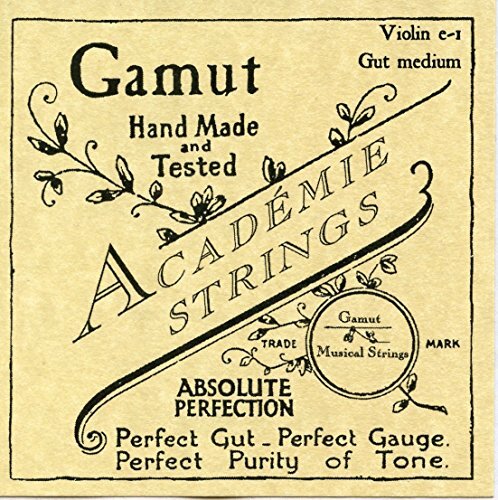 These strings are manufactured in the USA by Gamut Music, a leader in the revival of early music strings and instruments. Gut strings are not intended to be used with fine tuners or string adjusters and those devices should be removed before installing the gut string on the instrument. If you have any questions about this product by Academie, contact us by completing and submitting the form below. If you are looking for a specif part number, please include it with your message.